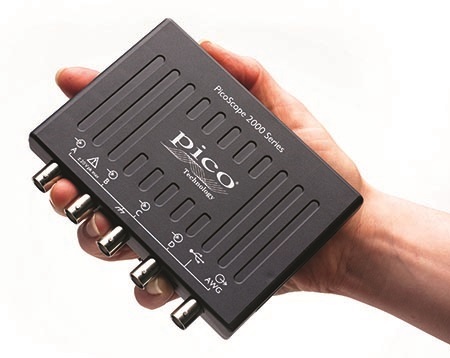 Met de PicoScope 2400 Serie ultra-compact instapmodel USB Oscilloscopen krijgt u een oscilloscoop, spectrum analyzer en arbitrary waveform generator in één voor een zeer aantrekkelijke prijs. De PicoScope 2400 serie bevat de eerste USB–powered oscilloscope die in staat is om sampling van gigasample per second te doen. Voorheen waren zulke hoge sampling rates alleen mogelijk bij een op de netstroomaangesloten scope, en nooit op een instapmodel. Voor herhaalde sigalen kan de sampling rate verhoogt worden to wel 10 gigasamples per seconde door gebruik te maken van ETS equivalent–time sampling. Deze hoge sampling rates gecombineerd met de mogelijkheid om tot 500,000 samples op te slaan in de scope’s buffer geheugen en analoge bandbreedtes tot 200 MHz maken de PicoScope 2400 serie geschikt voor gebruikt in een zeer groot aantal toepassingen. De PicoScope 2400 is niet alleen een zeer sterk 4-kanaals oscilloscope die gebruikt maakt van dezelfde PicoScope softwarevoor Windows die ook geleverd wordt bij de high–end scopen, u kunt de PicoScope 2400 ook als multimeter, spectrum analyzer, function generator and arbitrary waveform generator (AWG) gebruiken. he compact design of your PicoScope 2400 USB oscilloscope means that is small and light enough for you to take it with you. Simply place it your laptop bag or buy a PicoScope carry case and you can have access to an advanced test and measurement lab wherever you are. The PicoScope 2400 range of USB oscilloscopes obtain their power from the USB 2.0 interface (USB3.0 compatibe), so there’s no need to bother with batteries or an external power supply. The USB port also delivers high–speed data to your PC to give you a responsive, high–resolution display. Unlike other low–cost oscilloscopes that may be supplied with software that has limited functionality, the PicoScope 2400 range of USB oscilloscopes are supplied with the same PicoScope software for Windows that comes with our high–end scopes. This gives you the same software features and functions that are available for scopes costing a lot more money, and should you wish to upgrade to a higher–spec scope in the future you will be able to do so seamlessly. All PicoScopes in the 2400 oscilloscope range feature a built–in function generator. With this you can generate standard waveforms such as sine, square and triangle from a library of stored waveforms. You can also define your own waveforms using the power of the built–in arbitrary waveform generator (AWG). PicoScope 2400 entry–level oscilloscopes give you powerful features and performance at a price that makes them ideal for everyone from hobbyists and field service engineers to educational and professional users. Their compact and robust design means you really can take them anywhere. Being USB–powered there’s no need to worry about power supplies or batteries. The familiar Windows interface and controls make the software easy for you to learn and use. While the free software updates ensure you will always get the latest features and enhancements. With a dual–channel USB oscilloscope, spectrum analyzer, function generator, arbitrary waveform generator and multimeter all in one inexpensive package a PicoScope 2400 oscilloscope will give you a powerful entry–level instrument with professional–level performance and features. group of 8 inputs counts as a channel. Maximum sampling rate on MSO digital channels is 500 MS/s. Triggering None Free-run or up to 1 billion waveform cycles or frequency sweeps. Triggered from scope trigger or manually. * These specifications apply when using the drivers / writing your own software. PC connectivity USB 2.0 (USB 3.0/3.1 compatible). Free software available for download PicoScope 6 (beta) for Linux and OS X. Please note that the Linux and OS X beta versions of PicoScope do not yet have mask limit test or math channel functions.